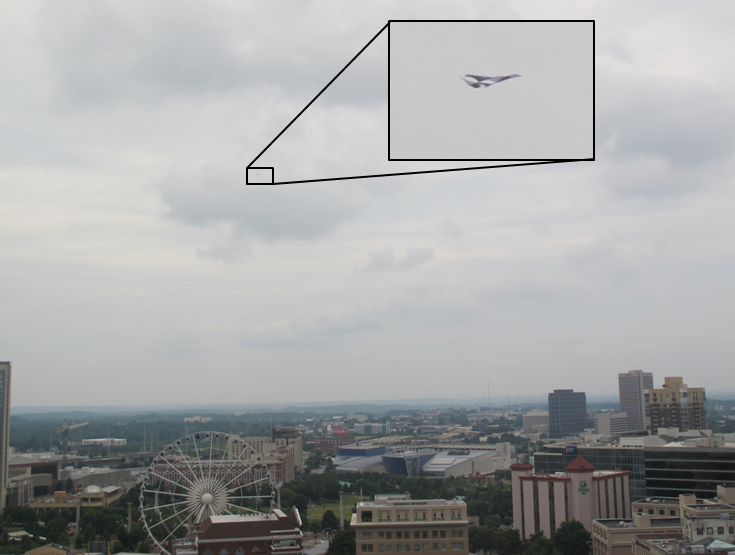 This new UFO video recorded stationary hovering over Atlanta Georgia 24th July 201. If you look close there is asmall chance the craft may be a stealth plane of somesort, but if so its is very unsual it would be hovering over the city. Filmers comments: Hovering object in sky over downtown Atlanta. Object was about 20feet wide. 1. We were on the 15th floor of a high rise building in Atlanta. We were working. 2. We were looking out the window and it was significantly above a 200ft Ferris Wheel. 3. Various accounts in the office: a kite, a stealth bomber, a drone, an airplane & a weather balloon. 4. It hovered mostly stationary with occasional changes in elevation. New UFO Video report in from Hershey Pennsylvania - what were these 2 lights? Eyewitness comments: 3 bright orange fireballs seen over the Hershey, PA area. Stayed stationary the entire duration and did not lose altitude at any time, as aerial flares would do. Each of the lights would randomly flicker and "turn off" and then "turn back on" in the same position. Lasted about 6 minutes before theyd just seemed to turn off the lights one by one. If you also witnessed a UFO in the regions mentioned below please respond to this post with your sighting. On july 6 2013 , 9:45 pm. was driving west on rt 322 in ashtabula county just east of Orwell, ohio. saw 2 red orbsin the south westsky.hard to gauge size or hieght. it was a stormy lightning filled sky. they flew from sw sky to ne sky, turned ,rose, and dipped in own seperate flight path. were in my field of view for about 1 min. also odd was about 10 min. prior to sightng, lasting for appr. 10 min.after, an alarm/buzzer started going off inside my dashboard . owned car 8yrs. never happened before or since. just thinking about this gives me goosebumps. My girlfriend and I was driving home from nelsonville on 33. We were about a half mile southeast of the 328 exit when we saw it streak across the sky and go in behind some hills.it was cigar shaped with several lights along the side of it flying extremely low, under 200 feet id say. I looked at my girlfriend who was shaking with fear and asked her if I really saw what I thought I saw and she said yes. This was the second time in two weeks we have seen a strange object in the sky. The first was before the 4th of july fireworks. Im quite familiar with aircraft and this wasnt any airplane Ive ever seen and moved way too fast to be a blimp. west of st paul alberta canada,between midnight and 3 am me and 4 other people witnessed 10-100 objects flying in all directions and changing colors.,they moved at very high speeds and stop at an instant and go up down side to side and at angles.,at times they formed clusters of a whitish cloud shape and then seperate from it.,they seem to use clouds as cover.never seen anything at this magnitude before and i will remember this for the rest of my life. On the evening of July 13, 2013 at approximately 10:15 PM my wife and I were enjoying a campfire in our backyard on Hillsdale Drive, Franklin OH 45005. We noticed an orange, cylindrical comet-shaped object traveling across the sky at a high rate of speed (much slower than a shooting star, but about twice as fast as International Space Station), traveling from East to West 265 degrees magnetic. Object was losing altitude and an orange tale was noticeable; tale increased in length (Est. 10 mile long tail) as it approached the far west skyline. Approximately 20 degrees off the western horizon object stopped in sky and ejected 2 orbs then ejected an additional 2 orbs for a total of 4, they were very bright and would move in different patterns from a triangle to a horizontal straight line pattern slowly ascending then descending. We watched this activity for about 7 minutes when they slowly disappeared. Posters translation (rough): one luminaire Intense Dual Core UFO eventually orbited, with North arrumbamiento "(Traso Usual in such UFO phenomenology) If Artificial some events also were approximated, none matches the visual manifestation and Celeste apparent on the vault, the phenomenon continues ciendo still pointing at the sky so "Zenith." Did anyone else in LA witness this hugh bright object the other day? Sitting in the backyard with some friends. One of them said what are those lights in the sky? We all got up to look and all saw the same lights. Started with just two. Moved across from the East to northeast, then stopped forward motion, one headed more north then faded away, the other stayed in one spot then faded away. Another came across a little later, did the same thing. I went to grab a camera but couldn't focus on it. Went to grab a different camera from my car, saw another coming on the same path.Managed to video it but couldn't zoom enough. This was the last one we saw. Any throughts on this UFO video people? It coudlnt be something within the dahboard reflecting ? It seems to go behind the house at times. "At about 9.15pm as I was watching television I saw through the open lounge room door a blue light that came down like a beam not far from our house, or at least it looked like that," she said. "It came down from the sky, deathly quiet, and then disappeared." The woman said she had been stumped ever since she saw the eerie light. "My husband didn't see it as he was sitting in a different position," she said. "I posted it on Facebook but no one else had seen anything. It has intrigued me ever since because it was so eerie and there was no explanation as to why a blue light would just come down from the sky." The Bundaberg woman said she hoped someone could shed some light on what she had seen. "Of course there could be quite a simple explanation for it, but I can't think of one," she said. "Maybe someone else has seen something similar, if so, I would like to hear from them." The sighting was not the first for the woman, who said she had seen something odd several years ago as well. >> Woman catches Childers UFO on camera "There was also another incident when my husband, two of our friends and I sat on our verandah," she said. "Suddenly we saw a light in the sky that had come from nowhere, looked like a plane but was stationary and there was also no noise. "As we were watching it, it suddenly dove downwards and disappeared. No plane or even helicopter can do that."